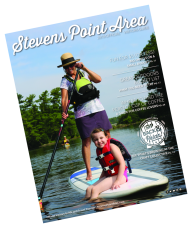 STEVENS POINT, Wis. (October 24, 2017) – The Stevens Point Area Tourism Development Committee will be accepting grant applications for costs related to the development of Stevens Point Area visitor attractions and amenities. This is the first time that this grant will be available. The deadline for applications is December 1, 2017. To be eligible, applicants must be a non-profit or a unit of government. Applicants must also be located within the Stevens Point Area Convention & Visitors Bureau service area. We represent and promote all of Portage County, Wisconsin. Grant applications are reviewed and considered by the Tourism Development Committee. Applicable projects include capital and special projects. Capital projects include new capital construction projects, upgrades, enhancements, expansions to existing facilities, and permanent exhibit installations. Special projects include exhibitions or events and signage. All grant applications will be reviewed based on tourism and operational criteria. All projects must contribute to the ability to attract visitors and improve overall tourism assets in the Stevens Point Area. To apply, please review the grant requirements in full at StevensPointArea.com/grant. Grant requests are due December 1 to be considered. Every grant application will be considered on its own merits and must be in accordance with the Wisconsin State Statute 66.0615. The Stevens Point Area Tourism Development Committee distributes a percentage of room tax revenue for the development, continuance, or expansion of visitor attractions and amenities to not-for-profits and units of government. Each project selected will be of the highest quality and benefit tourism within the Stevens Point Area. The Stevens Point Area Convention & Visitors Bureau is an economic and community development organization whose purpose is to expand Portage County’s economy by attracting conventions, sporting events and leisure tourists to Portage County. Millions of dollars from visitor spending and increased tax revenues are generated to increase commerce, sustain jobs and to create a desirable destination.